TORONTO, May 25, 2018 – Woodbine horseplayers will be seeing more green very soon. While turf stakes racing is scheduled to begin this weekend on the world-renowned E.P. Taylor Turf Course, progress is well underway on the installation of the Toronto racetrack’s second complimentary turf track. 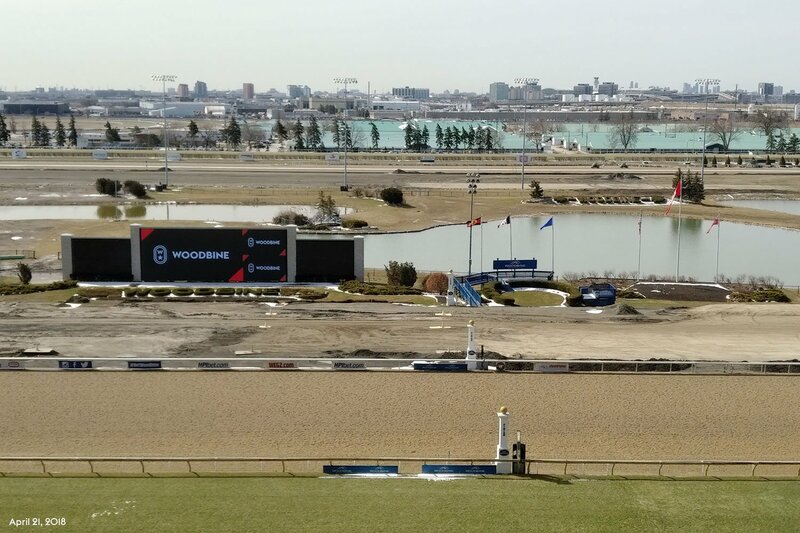 With Woodbine now hosting Standardbred racing fulltime at Woodbine Mohawk Park, the lengthy process to transform the inner seven-eighths mile oval into a second Thoroughbred turf course began following the April 9 conclusion of the final harness racing meet at the Toronto venue. The removal of the Standardbred racing surface, consisting of crushed trap rock, took place over four weeks. Approximately 12,000 metric tonnes of mixed trap rock and limestone material have been removed and the track has been shaved down on the outside of the graded turns by approximately three feet. 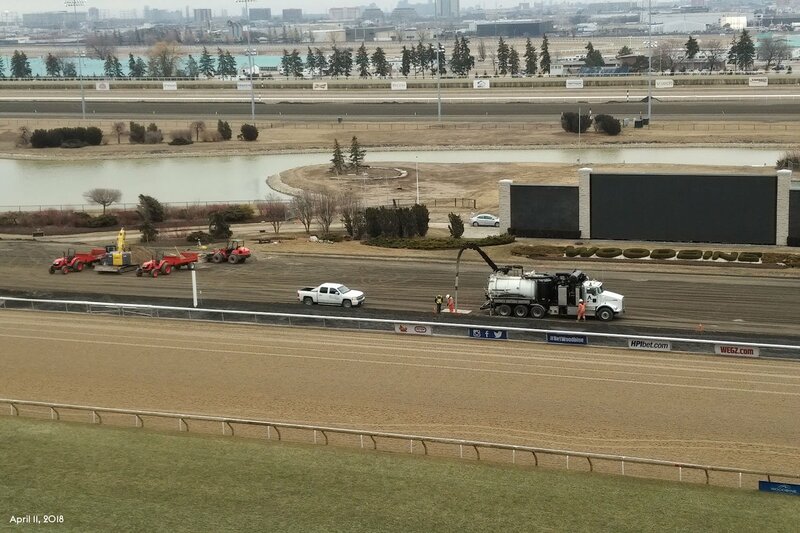 “Right now, they have done all the dirt work,” reported Irwin Driedger, Director of Thoroughbred Racing Surfaces & Fleet at Woodbine Entertainment. “The track has now been lowered to the level it will be when the turf is added. The old track had a 12 per cent slope on the turns and this new turf track will have a six per cent slope on the turns, so it’s been lowered a lot. The turf track will have a vertical drainage system, which will provide quick drainage when it rains and ultimately keep more races on the turf when weather conditions are not ideal. “The irrigation and drainage systems must be fully functioning before the sod is laid down because once the sod is laid down, we have to be able to water it, otherwise it will die,” noted Driedger. Woodbine’s new turf track will consist mostly of Kentucky Bluegrass, a perennial cold weather, low-growing grass best suited for Ontario’s climate. The turf has been growing on a sod farm about a half-hour north of the racetrack since 2015 and is fully matured and ready to be harvested. It will be cut into long strips of sod then it will be laid down on the track, which will be built in 500-foot increments. 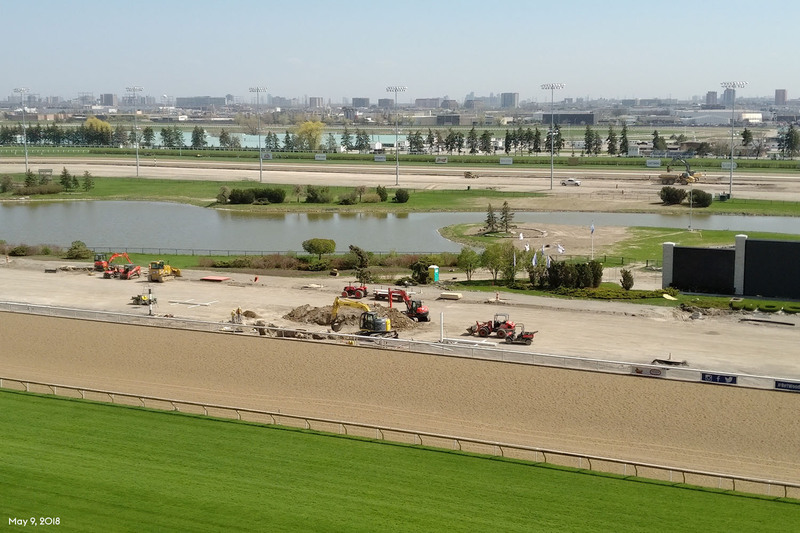 The complex project involves the coordination of many teams working around schedules that avoid disruption to Woodbine’s current Thoroughbred racing meet. 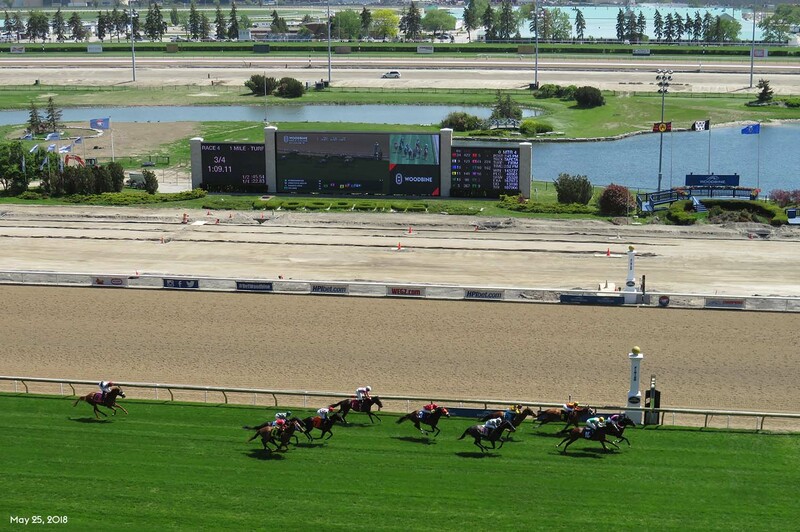 With the appeal turf racing has to both fans and horsepeople, the second course will provide Woodbine with the opportunity to grow its racing product and become the premier turf destination in North America. This entry was posted in Woodbine News and tagged Horse Racing, Irwin Driedger, Turf Racing, Woodbine. Bookmark the permalink.